I woke up to a beautiful, sunny, but, rather chilly morning in Manhattan. The temperature was 29 degrees and there was a slight breeze in the air. It did feel cold compared to the record 60 degrees the day before. Often I think about food when I wake up. Today was one of those days. I made anchovies with pasta the night before. I could still taste the anchovies with garlic and breadcrumbs. Growing up in New Orleans has taught me that my most fulfilling meals contain seafood with attitude. Jambalaya, gumbo and blackened catfish make me happy. An oyster po boy makes me go wild. Fresh oysters make me dance. Today, I felt like dancing. 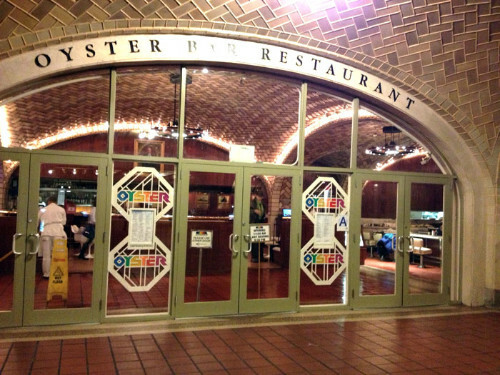 And there is only one place in Manhattan that can really satisfy my whimsy for fresh oysters. 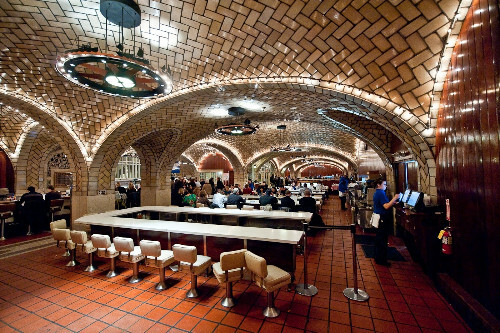 That place is the historical Grand Central Oyster Bar, located in the lower level of the 'Fine Dining Hall' at Grand Central Station on 42nd Street and Lexington Avenue. My friend, Jeremy Gatto is the general manager. 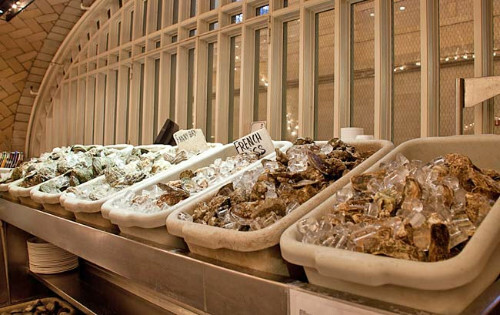 He knows what to do when I come and in and say, 'Today is Oyster Monday. Can you order for me?'. Not only does Jeremy order food for me, but, he also pairs my meal with wines. Mr. Gatto is the wine director, as well, and knows every bottle of his six thousand bottle inventory. Shortly after being seated, Jeremy talked to my waiter and then disappeared. Just like magic, a glass of 2013 Hugel Riesling ($10) appeared with an order of Roasted Bluepoint Oysters with grilled pineapple citrus vodka butter ($13). It was a first for me. The grilled pineapple citrus vodka butter softened the bluepoint oysters to such a point that each bite tasted like a creamy, sweet soft pancake. My palate exploded with pleasure as I sipped the Riesling, which paired perfectly with the dish. The waiter refilled my wine glass with a 2014 Vrignaud Chablis ($15) from Burgundy. I sampled the wine and loved the crisp, acidic, lemony profile that is tailor made for seafood dishes. 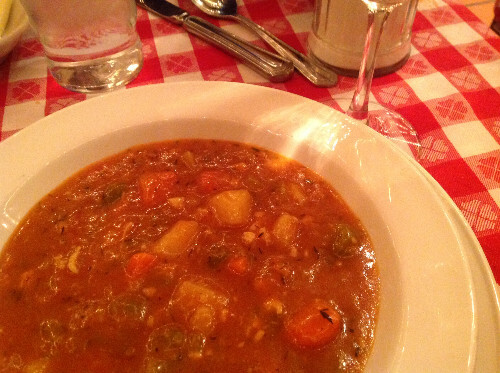 It went well with Chef Sandy Ingber's colorful Manhattan Clam Chowder ($7). 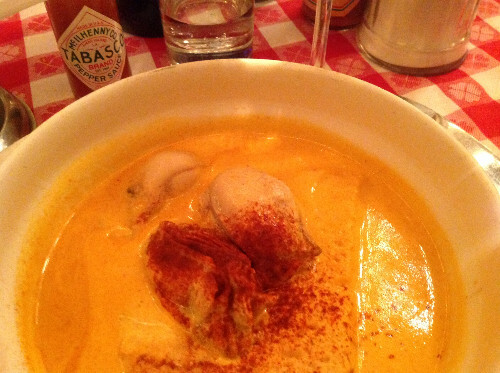 The chowder was thick, full of clams and vegetables swimming in an overly tasty and mildly spicy roux. A faint resemblance of Gumbo came to mind. The waiter cleaned off the table, poured a lovely glass of 2013 Baglio di Pianetto Ficilgno Viognier & Insolia ($12) form Sicily and proceeded to explain that my next course consisted of six shucked oysters, three were the sweet Gigacup Select from Washington state and the other three were the briny Contuit oysters from Massachusetts ($18). Add cocktail sauce with tobasco and a drop of amazing horseradish to each oyster and you are in heaven. I squeezed a little lemon on top of each oyster to balance the acidity with the wine. Normally, I would eat these oysters in five minutes, but, in this case case, maybe because they were so fresh and good, I took twenty minutes to complete this course. 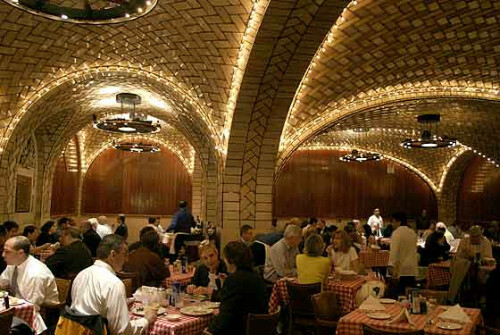 Shortly afterwards, one of the signature dishes of Grand Central Oyster Bar magically appeared on the table. It was none other than a bowl of Oyster Pan Roast ($14). 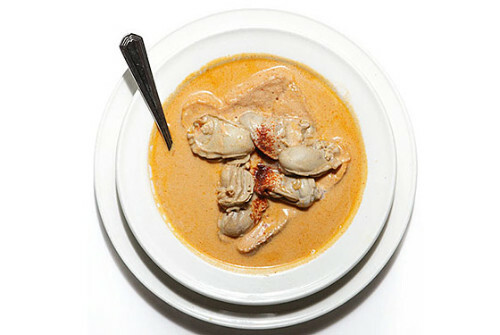 It is made with cream, butter, clam juice, and sweet chili sauce. 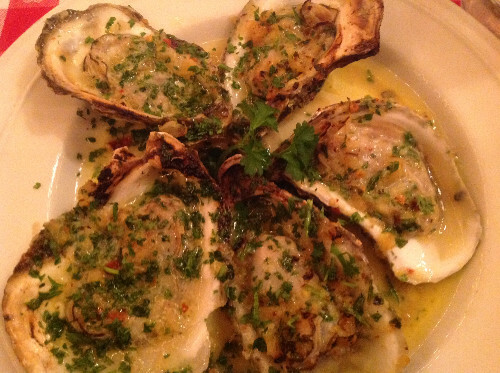 The roasted oysters float on top of a piece of toast, with a dash of cayenne on top. The dish is outrageous and quite unique. 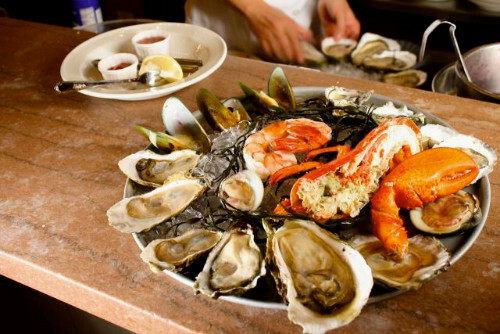 Customers flock to the restaurant for this dish as well as pan roasted cherrystone clams, shrimp, lobster, Ipswich clams or sea scallops. I was beginning to get full, but, had room for one more course. Jeremy outdid himself when he picked one of the specials of the day--Cajun grilled Florida Red Grouper Filet with Papaya-Tomatillo Salsa and Refried Beans ($36). 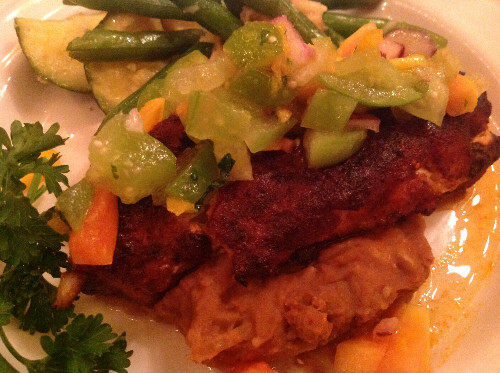 The fish melted into the refried beans and became another flavor, unique to any other. I am not sure if Chef Ingber intended this or not, but, if he did, the mixture was genius.